Him having been effectively and roundly voted out of power and the trust of his own people in the Nantong Constituency, in the Northern Region, ought to inform Mr. Ibrahim Murtala Mohammed that as far as the Ghanaian voter is concerned, he has absolutely no credibility (See “Akufo-Addo Has Perfected Political Corruption – Murtala Mohammed” Ghanaweb.com 2/22/18). First of all, any levelheaded and critically thinking Ghanaian citizen would not take the word of a pathological charlatan and a brazen political opportunist like Mr. Ibrahim Murtala Mohammed any more seriously than the substance of rumor and gossip. 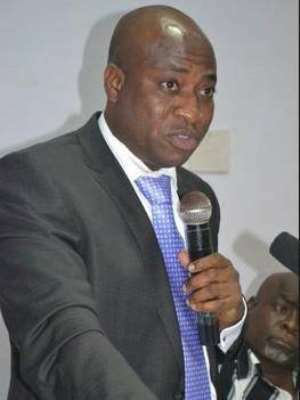 The fact of the matter is that a man who crossed over from the rump-Convention People’s Party (r-CPP), in order to voraciously scramble for crumbs dished him as Deputy Trade Minister by former President John Dramani Mahama, very likely as part of the latter’s shameless nepotistic agenda of packing his government chock-full with northern-descended Ghanaian citizens, with absolutely no regard for competence, all in the dubious name of Affirmation Action, cannot be taken any more seriously than a street-soliciting male prostitute. And, of course, we were all eyewitnesses to the massive and epic failure of former President Mahama’s so-called SADA (Savannah Accelerated Development Authority) program. And today, even as Ms. OtikoAfisaDjaba, the Minister for Gender, Children and Social Protection, bitterly tells it, Ghanaians of northern descent are far worse off for the veritable nuisance that was the ethnocentric and ethnically chauvinistic SADA program than they were before her first-cousin Dramani acceded to the Flagstaff House and Mr. Kofi Antubam’s State Chair and Mace. That the gross and unprecedented incompetence of the Mahama-led regime of the National Democratic Congress (NDC) cannot be the least bit meliorated by Mr. Mohammed’s wickedly self-serving and sophistic touting of his democratically deposed former benefactor as a man with absolutely no remarkable academic or professional grounding in the critical discipline of economics, and yet was, somehow, able to successfully navigate the treacherous shoals of the country’s economy as Head of the Economic Management Team under the tenure of President John Evans Atta-Mills, is self-evident. Now, that is quite a good try, but it does not get the rabid Akufo-Addo critic very far, because the rump-Convention People’s Party operative was never even fully accepted by the movers-and-shakers of the outgone Mahama regime. But even more telling is the fact that the critic suavely and conveniently skirts around the fact that the so-called EMT Head was also under a high-powered investigation by his own boss at the time of the highly suspicious death of President Mills, an issue that the recently named Independent Special Prosecutor, Mr. Martin Amidu, may do the Ghanaian taxpayer great good to explore in the offing. Indeed, were he not pathologically deficient in the culturally and morally cherished quality of honesty, Mr. Mohammed would have readily and unreservedly acknowledged the inescapable fact that as Vice-President to then-President John Evans Atta-Mills, Mr. Mahama had merely become the lucky beneficiary of the veritable and vintage fruits of the fiscally responsible and progressive policy measures put in place by the recently departed John Agyekum-Kufuor-led government of the New Patriotic Party (NPP). Needless to say, the genius of Dr. Kwabena Duffuor, the Atta-Mills Finance Minister, had far more to do with whatever minimal economic successes had been chalked by that rag-tag regime than anything that a practically and decidedly clueless Vice-President Mahama may have contributed as EMT Head. Predictably, by the close of the Mills government, in mid-2012, the country was, once again, beginning to experience the rotten fruits of the gross and perennial managerial incompetence of the Rawlings-fangled regimes of the National Democratic Congress. What is equally fascinating, if also for its unmistakably fatuous vacuity, is the fact that a propagandistically facile and soft-brained Mr. Mohammed fails to sensibly account for the real reasons why an economically “innocent” Vice-President like Mr. John Mahama could have successfully headed President Mills’ Economic Management Team. It is like arguing that the best managers of Ghana’s economy are journalists and public relations operatives trained in International Relations at Leningrad. The former r-CPP-MP has absolutely no legs upon which to stand his corruption charges against President Addo DankwaAkufo-Addo, and so he facilely resorts to the mindless recitation of the largely self-serving tirades of Mr. Kennedy Ohene Agyapong, the NPP-MP for Assin-Central, against some Flagstaff House operatives, in lieu of hard facts and evidence. But what is even more fascinating and admirable about Mr. Mohammed’s characteristically unsubstantiated accusations of corruption against President Akufo-Addo, is the fact that the critic himself is fully mindful of the fact that the politics and the political culture of rank corruption have far more to do with such left-leaning political parties as the proto-Convention People’s Party (CPP) and the National Democratic Congress than any other ideological group or camp. This is obviously the reason why Mr. Mohammed can only glancingly or tangentially accuse Nana Akufo-Addo of “having perfected corruption” in government. You see, the patent for the architecture of rank corruption in Ghana society and politics is the especial preserve of the Mahama Posse and such ideological and political antecedents as the Rawlings- and Mills-led regimes of the National Democratic Congress. To hear Mr. Daniel Domelevo, the Auditor-General, tell it, it was the NDC that invented the reckless and thievish culture of budgetary inflation. You bet I am referring to the GHȻ 5.4 Billion Question.